There are lots of biker dating websites out there right now but most if not many of them promote dating and forming serious relationships. This is probably what sets BikerorNot.com apart from the rest because its focus is none of the two mentioned. This particular platform cannot really be considered as a dating website mainly because it is made to serve a social blogging purpose instead of dating. But, it doesn’t mean that you will no longer find your special someone here. So, how does BikerorNot work and what can you expect the moment you join it? Biker or Not serves as a social networking for bikers from all over the world, sharing thoughts and passions instead of the usual dating scheme. The only thing that makes it similar to other biker sites is that this is strictly meant for bikers and biking aficionados. It is the very reason why many users are at a consensus in saying that this site is something worthy to check out due to the something new and unique that it has to offer. It doesn’t really matter if you are part of any biker’s club or not since Biker or Not is here to ensure that you will stay up to date with all the latest events happening around you while letting you meet and make new friends during the process. If you will think about it, Biker or Not pretty much works like Facebook exclusively for bikers. Biker or Not is completely available for free without any hidden costs. Every social network that is related to this website is available in just one click and without the need to pay any amount of money. 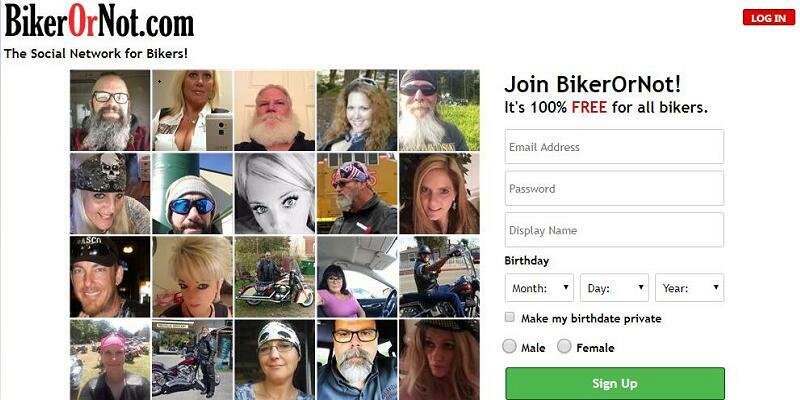 Biker or Not isn’t only about a biker dating website. It’s more about a biker social network community. You will be able to see every element of social network in this dating site. Not only you may clear up your relationship status as single or taken, but also, you will find options for single men and women who want to find a potential partner easily. These options include “Backseat advisable” and “Find and fill a backseat”. The fan page feature is inspired by Facebook but it is a great way to generate your fan following. If you want to keep your profile private then you can create a fan page to interact with others. In the section of “Bike Garage”, you may share photos of the motorcycle you’re riding and give detailed information regarding it to make some people interested. Another unique feature from Biker or Not is “Invite to Ride”, which includes several services like “Create an Event or Ride”. You may join any even if it is opened for everybody and you can also create your own event and invite friends to meet up. Aside from those features, you may visit store to purchase the best clothes and gadgets related to motorbikes and sell your motorcycle if you want it. The process of signing up at Biker or Not is straightforward and easy. You may also sign up through connecting with Facebook. You may also fill up your profile with more advanced and basic information like riding habits and relationship status. Adding pictures is optional, yet this makes your profile much reliable. Biker or Not is a perfect choice if you like to find local biker friends and discuss motorcycle culture since you will be able to see every exciting thing about biker life through blogging in this dating site. Nevertheless, if you’re searching for a biker single for relationship and love, you have to try other dating service.